Digital Taps for Clark Terry? One would of thought, considering the man being buried, that a real trumpeter would have been used. I can think of about 100 players (me being one of them) who would have gladly sounded the call at the service. There is NO regulation that states Taps must be performed by a military person. It could have been sounded by a live musician. I am not aware of the circumstances but feel very sad that this would have happened. 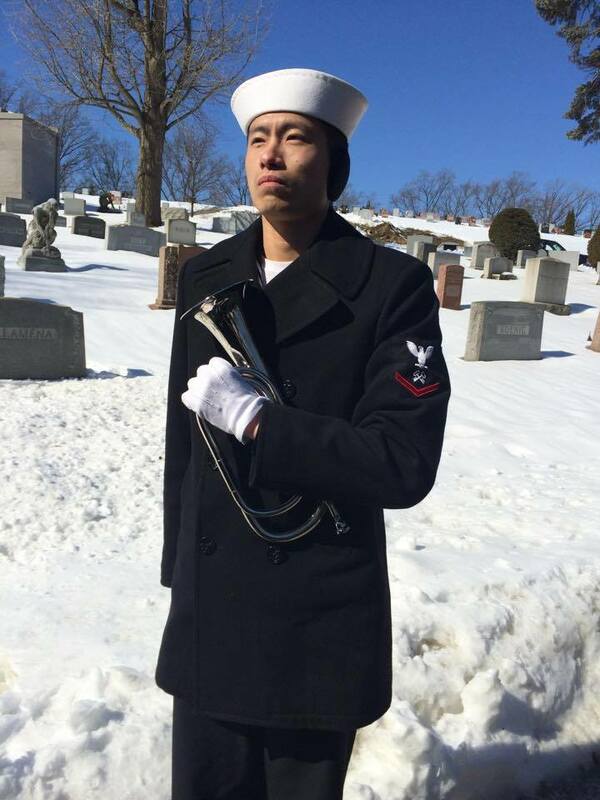 It could be as simple as when the funeral home contacted the Navy to provide honors they were informed “yes, we’ll send a bugler.” They may have had no idea who the man under the flag was. Most Military Funeral Honors details around the country send the recorded Taps. Approximately 80% of military funerals use the digital bugle today. Almost all the Veteran Service Organizations (VSOs) (America Legion, VFW etc..) use the fake bugle too. While the Department of Defense Instruction calls for the use of military or civilian buglers (volunteer or contracted), many Funeral Honors programs (Military and VSO) simply don’t for many reasons. Here are a few IMO. 1. Many don’t access to a military bugler through active duty, guard or reserves. 2. Many don’t have the resources to pay for them although there is a Federal Stipend available for buglers playing Taps. 4. They’ve had some really bad players show up. 5. They prefer to have someone in uniform as part of the detail. 6. Some rather have the recording to insure a “prefect” Taps. It also happens that in the military too. Sometimes they refuse to let a real person play in place of the digital. However, This is NOT true everywhere. Many military and VSOs are happy to have a live player. And I hope many trumpeters do step up to render this important honor for our veterans. One thing to remember for those who work with Military or VSOs,-CHECK YOUR EGO AT THE DOOR. If you work with a group, talk politely to the person in charge of the detail. Don’t be pissed if they ask to hear you play before the service. I actually had a guy who wanted to work for my program but wouldn’t audition for me, even when I offered to drive to his location in NE Maryland. “I DON’T AUDITION FOR ANYONE! !” Needless to say he wasn’t hired…. Sometimes we musicians can be our worst enemy. 5.3.7. Provide a bugler, either military or civilian, for the sounding of Taps. Bugler support may be contracted or voluntary. The Military Service responsible for providing military funeral honors shall ensure that there is an active search for a bugler. If none is available, the Service representative may authorize the playing of a high quality recording of Taps on a stereo player or ceremonial bugle and shall ensure that it is available. I’m just wondering what was going through the minds of all the musicians (many who have lost gigs because of recorded music) standing at the graveside when the recording of Taps started. while I’m sad this happened at the funeral for Clark Terry, I am glad to see the awareness of the need for live players for our veterans! This entry was posted on Monday, March 2nd, 2015 at 12:03 pm	and is filed under History of Taps. You can follow any responses to this entry through the RSS 2.0 feed. You can leave a response, or trackback from your own site. Thanks so much Cheryl. For all you do!